Quantum Hash is one of the latest Bitcoin cloud mining operations to enter the cryptocurrency realm. Claiming to be the next generation of cloud mining, Quantum Hash asserts their operation as the most lucrative and secure Bitcoin mining destination with no relative proof. As with most newly established cloud mining sites, Quantum Hash does not offer a sustainable business model which indicates to us that eventually this operation will self-implode and stop acknowledging withdrawals requests and most probably resort to straight theft. Quantum Hash, which is hosted at QuantumHash.net, was created almost two months ago, on September 22nd, 2017. Now, since quantumhash.net is still in their early childhood phase, we have been unsuccessful in unearthing any complaints regarding this operation. Nevertheless we will still expose the truth behind Quantum Hash and share why this is not a trustworthy cloud mining site. Quantum Hash is your one stop shop to Bitcoin mining, or at least that is what their site would prefer you to believe. As you will catch on, Quantum Hash is the epitome of a get-rich-quick scheme. Your Bitcoin deposits are mined by their team of cryptocurrency miners where they will do all the hard-work for you. Within 10 short days, you will be able to execute a withdrawal to receive a cumulative minimum 100% return on your original deposit. Prospective investors are able to choose between 3 separate investment plans available at quantumhash.net. The amount of your initial deposit will dictate which membership package you are eligible to enroll in. According to the site, no matter which plan you get started with will secure you daily earnings forever. Most definitely! Quantum Hash claims to generate some of the most ridiculous returns we have come across in regards to cloud mining sites. While the most lucrative cloud mining operation has reported only an annual return under 30%, this operation is claiming to surpass that verified return in just 3 days! It is evident that Quantum Hash is another get-rich-quick scam that embodies the business model on a Ponzi scheme. Does the site provide any information regarding the owners? As with most suspicious cloud mining operations, information regarding their mission statement and alleged business operations are discussed, but nothing really in regards to the owners or operators is made clear. 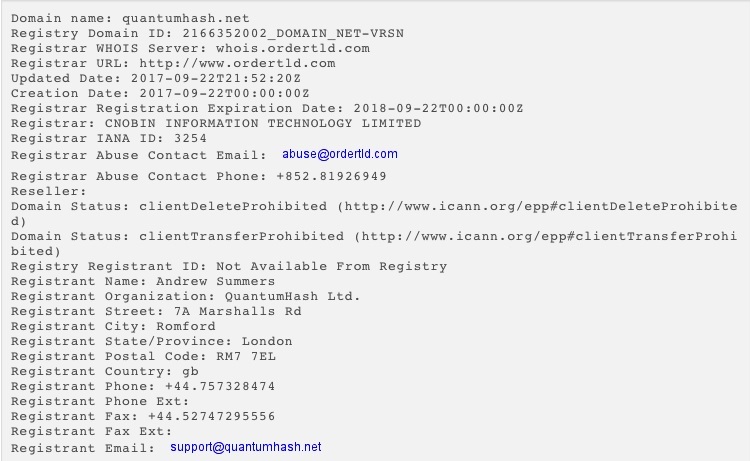 On the Contact page, we are provided with information regarding the corporate entity behind Quantum Hash which allegedly is QuantumHash Ltd.
A CompaniesHouse search will confirm that QuantumHash Ltd is indeed an incorporated company that has been active since September 25th, 2017. 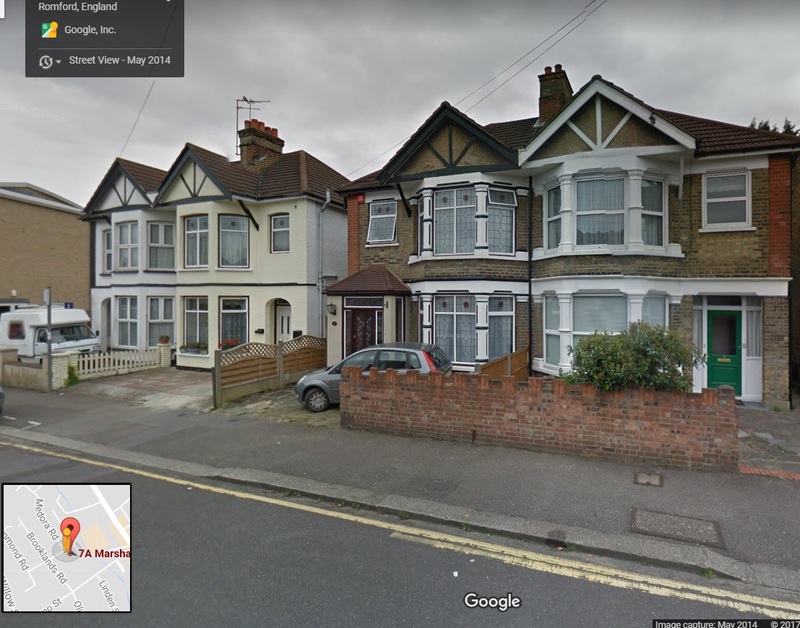 Registered under the company number 10980074, this private limited company registered office address is 7a Marshalls Road, Romford, United Kingdom, RM7 7EL. Furthermore, the director behind QuantumHash Ltd is a 25 year old person, known as Andrew Summers who resides within the United Kingdom. A who.is search will inform us that this domain was brought into existence on September 22nd, 2017. The registrar behind this domain matches the appointed director Andrew Summers, which is a rare since most questionable cloud mining operations like Quantum Hash employ privacy blockers to hide their identity. The provided address on the site would be the same address that is registered for QuantumHash Ltd. This address is 7a Marshalls Road, Romford, United Kingdom, RM7 7EL. Perhaps if this site goes viral then the webmaster behind the site will go through the measures necessary to make their operation appear anonymous which, consequently, most end up doing in the long run. What is community feedback suggesting? Most of the feedback regarding the legitimacy of Quantum Hash is inconclusive. While some reviews and videos can be found that are classifying Quantum Hash as a Bitcoin Ponzi scheme, it appears that the overall consensus of this cloud mining operation is unverified. Naturally most of these inconclusive reviews are including affiliate links in their reviews where they will earn a 10% commission bonus for each converted member. During the time of posting this review (November 11, 2017), a SimilarWeb.com search showed that quantumhash.net had a global rank of 85,170, indicating it was quite popular, although much of this traffic is paid for, and not organic. Most of the visitors who browse the site reside within Russia, Ukraine, Brazil, India and Vietnam. Quantum Hash is an unproven and questionable cloud mining operation that has yet to suffer animosity from the general public. The unnaturally steep Bitcoin deposits required coupled with the unbelievable high ROIs certainly raises our suspicions in regards to the legitimacy of this operation. No source of income besides those who deposit into the site can be verified which makes Quantum Hash resemble a business model most similar to a Ponzi scheme. Our advice would be to avoid Quantum Hash and only invest your cryptocurrencies with Verified Cryptocurrency Solutions. Review Verdict: Quantum Hash is a SCAM! Have you been scammed by Quantum Hash? Share your experience or knowledge by commenting below! You are right,that site is a scam.Now it is gone,nobody could access it anymore. Well I first wait and they are just like auroramine who also went under. I had not invested money but they took my precious time. We have shutdown our project after server failure, we are refunding only investment amount from the genesis mining plateform. genisis mining charging 20% of refund transation you have to pay 20% from outside so that we can go for refund process, we will not deducte any amount from your balance. this is the only way to refund you send 20% on below mention Btc address and send us screeshot of sucessfull transation with your log in ids and btc wallet address. This is what they answer me to the request of rembourse. How can I trust about this? what are you going to do in this case? or maybe lose another 0.004 hoping for rembourse? We have shutdown our project after server failure, we are refunding only investment amount from the genesis mining platform. genesis mining charging 20% of refund transaction you have to pay 20% from outside so that we can go for refund process, we will not deduct any amount from your balance. this is the only way to refund you send 20% on below mention Btc address and send us screenshot of successful transaction with your log in ids and btc wallet address. Quantumhash is nothing but a huge scam. The site has been down since 12/11/17 and they are not replying mails sent to them. did you pay the 20% they ask in advance? on Withdrawl 0.003 waiting for another. .. The website is a scam. I invested 0.00267 worth of btc and after 2 withdrawals, they were gone. Quantum hash have not pay from 11 November ,I contacte them with email but not reply and on 12 November 3.25 pm as Indian time this site is down so quantum hash is also scam scam scam,don’t invest here…. Yes i am agree with your comments. Quantum hash is very worst website so plz dont invest in this site.